Trayvon Martin could have been any of us. Oscar Grant, Jarrel Gray, Daniel Vail — the state, the justice system and police have failed us. Because of a #whitesupremacist culture, George Zimmerman will walk free and one more youth of color’s life will be cut short for nothing. Trayvon Martin will not be forgotten. We are calling for a One Hundred Hoodie March in Downtown Frederick in remembrance of all victims of injustice, locally, nationally and internationally. Please bring a black hoodie, and come with friends and loved ones to remember people killed or forgotten by the state. Meet up on the South End Park corner of Catoctin Ave. and Burke St.
Meet up at 8:30pm, leave at 9:15pm. -$2-5 suggested donation for the church. 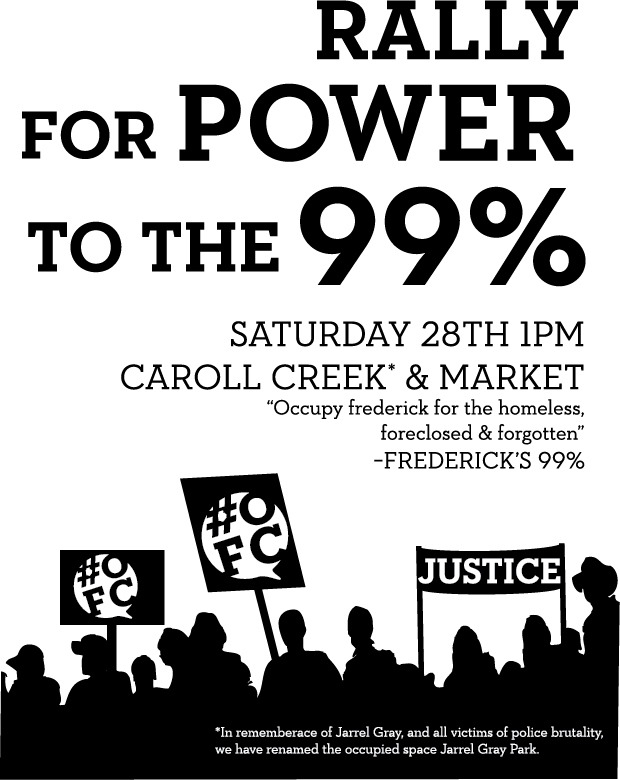 Come celebrate a year of Occupy in Frederick! On the anniversary of Occupy Frederick’s very first action we’re getting together with our friends and comrades to reflect on the ups and downs of the year’s activity, and to discuss the future of radical/progressive organizing in the community. After the discussion we’ll switch to party mode with a potluck, music, and drinks for those of us of age. 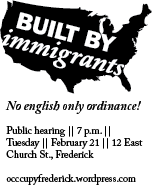 All are welcome; organizers, allies, participants, supporters, and anyone interested in movements for social change/curious about organizing for social justice in Frederick are encouraged to attend (the more the merrier!). Join Occupy Our Homes Frederick and others from the community as we help each other through housing troubles and discuss solutions to land and housing issues. A day of arming yourself with the knowledge you need to secure your housing rights! Legal counseling for those in foreclosure; learn about squatting; the story of Umoja Village and the Take Back the Land Movement; a discussion around homeless issues led by people from the homeless community with local aid organizations. All occupy frederick’s updates will be coming from the website http://www.occupyg8-2012.org, for more info please go there. The Foreclosure Defense Work Shop, initially planned for tomorrow at the Hill Cress Community Center is now at the Friends Meeting House–located at 723 N. Market Street. Thank you for the helping making this event happen. Sorry, for the last minute confusion and stress. Rally for Power to the 99%. Some of the Local news coverage from around the area, please read the needed support items, come down for our evening GA’s. Genreal Assemblies will be held at Sunday 4:00pm at The friends meeting house.